Woman + Son Cross Still-Burning Street, originally uploaded by danagraves. Twelve years ago, I was in my last year of art school. From my vantage points as young man looking at the world he was about to enter, things looked nuts: the First Gulf War broke out; a big, nasty Recession was looming; and the Rodney King beating had become one of the first subjects of the citizen-journalism debate. 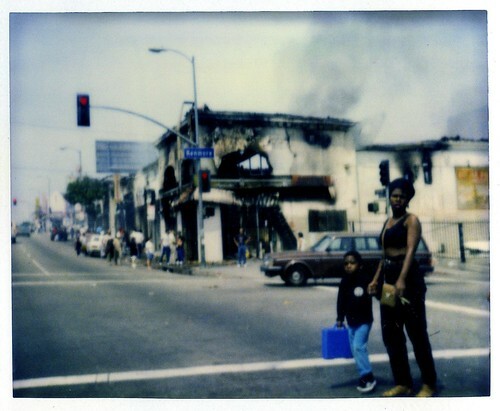 Go here to see some photos from the riots that broke out in LA after the Rodney King verdict brought the hammer down on a city seething with rage. On April 29, 1992, twelve jurors rendered their verdicts in a controversial case involving the 1991 beating of Rodney King by four LAPD officers. One of the officers was found guilty of excessive force; the other officers were cleared of all charges. At various points throughout the city that afternoon, people began rioting. For the next six days the violence and mayhem continued." These photos are what I saw in & around my LA neighborhood of Echo Park. 15 years ago, riots raged across Los Angeles and TV screens worldwide. Much of the media portrayed the riots as a response to the beating of Rodney King. But historian Mike Davis says that simple narrative did L.A. another injustice: it ignored the reality on the ground.